NASCAR racing has been big for years and with weekly races on TV, fans of NASCAR can get really charged up wanting to get into the action. Unfortunately, we can’t drive 200mph down our streets but there is a great way to have some extra fun while watching NASCAR…Play Fantasy NASCAR games. For fantasy sports players, the introduction of Fantasy NASCAR to the daily fantasy sports sites has been a welcome change where many diehard followers of the sport can make a nice bit of money while still getting to enjoy race day on Sunday. If you are interested in playing NASCAR fantasy leagues for real money, DraftKings is the #1 site to play at online. 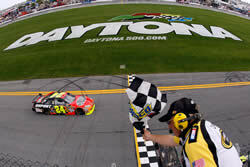 They run fantasy NASCAR games for real money througout the racing year starting with the Daytona 500. 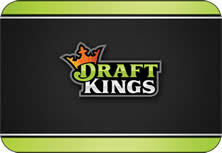 The game is simple and the competition is weak, so there is definitely easy money to be made playing at DraftKings.com. Experts in the field of NASCAR - DraftKings has had fantasy racing contests for a while now, so they know their stuff. Not tied in to a full season - DraftKings runs weekly fantasy pools, so you can pick and choose your spots to make money. Fantasy NASCAR contests with huge prize pools for real money! No free Fantasy NASCAR games - DraftKings doesn’t offer free Fantasy NASCAR games for their members, so you don’t get a chance to try out the daily fantasy site without making a deposit. Fortunately, by joining here, you get a FREE $3 contest entry with your first deposit...so it costs nothing to try things out and play your 1st real money game for FREE! NASCAR was the first to create their own version of a fantasy game. With trademarks and copyright issues, they were for the longest time, the only place to play NASCAR fantasy games. It’s free to enter - For something that doesn’t cost anything, you can play for the fun of it. Well organized - Up to date NASCAR info. Horrible prizes - Although the grand prize is a $5000 prize, the secondary prizes are a trip and NASCAR merchandise. That’s a lot of time to invest into a pool to only really has 2 good prizes and other crappy ones. Not to mention your odds of winning are very, very slim. It’s more labeled fantasy auto racing, but they use only NASCAR racing events and drivers. Yahoo NASCAR is another free Fantasy NASCAR game that allows you to play with friends in a private league or join as many public leagues as you wish. User friendly interface - Yahoo has excelled at creating a user friendly fantasy sports interface and their NASCAR fantasy game site is no exception. Create Leagues - With Yahoo, you can create a private or public leagues or simply join another public league if you don’t have a lot of NASCAR fantasy friends. It can be nice to play Fantasy NASCAR against people you know. No Prizes - You win, you get bragging rights, but there is no money or other prizes to be won. Unique Scoring system - Yahoo fantasy games have limits as to how often you can use NASCAR drivers on your fantasy team as well as a grouping list which can be confusing and limit who you really want to choose that week.